The Fellowship was fortunate enough to obtain a copy of CALL OF DUTY: ZOMBIES #1 from Dark Horse Comics. Justin Jordan writes, Jonathan Wayshak draws, Dan Jackson colors, and Michael Heisler letters. The zombies have destroyed almost everything, and only a few lucky people remain alive. Stu has done so with the help of the voice in his head, and that voice is telling him to find Russman, Marlton and Misty. Only together can they accomplish the goal, and they’re not even sure what the goal is. Or if they can trust each other. But the voice definitely has a plan. It also doesn’t help that the zombies have something new – a leader. The identity of the voice (no spoilers here) is also an interesting twist, but you’ll just have to read along to see where that twist goes. This first issue gives us the seed of a very cool story, and the art does a delightful job of being gruesome almost to a fault (but in a beautiful way, if that makes sense). Comics based on video games have a much better track record than movies based on the same. And I for one like Jordan’s work, so I’m looking forward to seeing where he and the art team take us. 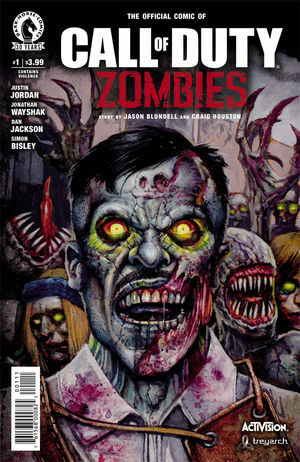 CALL OF DUTY: ZOMBIES #1 is available now at your FLCS or at darkhorse.com.